If you or a family member suffers from an injury caused by medical malpractice, please call us at (407) 647-6111 or fill out our form for a free consultation. Preventable medical errors are the 3rd leading cause of death in the United States, killing over 250,000 patients every year. Sometimes, these errors happen when a physician fails to follow the established rules for diagnosing and treating a suspected condition. However, often these errors are not caused by a single healthcare provider’s carelessness, but rather when rules put in place by hospitals to ensure patient safety are ignored or dismissed. These rules are known as "standards of care," and when you or your loved ones are hurt by a violation of these standards, the Constitution and laws of Florida give you the right to enforce them in the courts of this state. Regardless of the ways in which medical providers or hospitals cause these injuries, they bring with them devastating physical, psychological, and financial losses. We require no legal retainer or upfront fees, and you pay nothing unless we prevail. We center our practice on representing Floridians involved in medical malpractice claims, which ensures that this complex, technical, and demanding area of litigation receives our complete focus. No-Fee Promise Victims of poor medical care need serious help. We don't charge anything unless we get a jury verdict or settlement for our client. Personal Care Because our team is actually family, we provide our clients with a level of care and honest communication big firms cannot match. Our Case Results $4 Million Verdict for a client whose wife passed away from metastatic cervical cancer after her doctors misread an early pap smear that showed evidence of cancer. 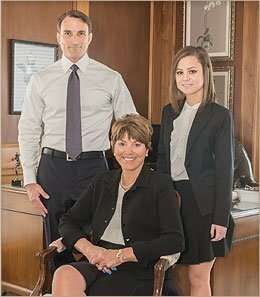 For the trial attorneys at Faiella & Gulden, P.A., representing patients is a calling that binds a family together. Our founding attorney, Elizabeth H. Faiella, is the daughter of renowned lawyer Rachel Johnson, who was a member of the Texas Bar for 50 years and served as a municipal judge. Elizabeth shares her practice with her son, attorney Peter J. "Tres" Gulden III, and his wife, attorney Rebecca E. Gulden. Elizabeth H. Faiella Elizabeth has represented plaintiffs in numerous jury trials since 1976. A member of the exclusive Inner Circle of Advocates, Elizabeth is a legal powerhouse who has been given numerous awards and honors--and she's not done yet. Peter J. "Tres" Gulden, III The son of a doctor and an attorney, Peter has a unique and in-depth understanding of all the complicated medical and legal issues involved in a malpractice claim. He has won many 7-figure verdicts for clients since joining his mother's firm in 2004. Rebecca E. Gulden A medical illustrator as well as an attorney, Rebecca joined the firm in 2015. Her grades in law school could have landed her at any firm in the country, but Faiella & Gulden, P.A, had all the prestige and resources of a big firm with client-centered family dynamic.